Do you ever wonder where all of your fantastic childhood friends are now? It is comforting to think that they stay the way they have always been, but we at the Clog couldn’t help but think about what our pastime pals are doing at the moment. This character is probably somewhere galavanting with his pal, Buster. However, when Buster is off on his many trips with his dad, Arthur is at work in his dog training class that he introduced at Petsmart. Ever since he got his dog, Pal, Arthur has put all his effort and energy into becoming the best dog whisperer in the world. Sometimes, Arthur will go to dog training seminars across the country to stay updated on the latest methods. None of us liked Angelica, but it is safe to say that she is probably well-off due to her ability to shake anyone in their skins. Angelica doesn’t have many friends, but she knows what is valuable to her and which friends to keep close. Angelica now serves as the CEO for a self-managed company that is centered around creating dolls. Angelica still has her Cynthia doll from childhood, since it always gives her a purpose for her daily grind. Imagine a taller version of the character we have all come to relate to — and with the same shrill voice, of course. He was never able to win the heart of Trixie Tang, but has discovered his real love — he is now married to Tootie and works as a math teacher at his local elementary school. Unfortunately, Timmy no longer has Wanda and Cosmo by his side, but they are constantly watching over him. As the only child, Timmy is under constant surveillance by his parents, but it’s not like he is doing anything super cool anyway. This undefeatable trio has the same prowess it is known for, but now with longer legs. Mojo Jojo is too old to do much harm. Instead, the girls, who are all lawyers now, must save the world from destruction using the power of loopholes. Their new enemy is Mrs. Vellum, who is trying to rebuild the entire city so it looks like a giant brain. This lovable friend is probably sleeping soundly in his little cave. When he is not sleeping, he is eating honey from a pot. Occasionally, Piglet will come and walk with Pooh when the days are sunny, but Pooh often finds himself wanting to be more and more by himself. Though many characters probably live different lives outside of television now, it is safe to say that much hasn’t changed with Pooh. Dora has retired from teaching Spanish to the masses. Instead, she works with her cousin Diego to help rescue lost animals in Costa Rica. Map and Boots remain best friends with Dora and aid her in her mission to increase biodiversity in the rainforests. 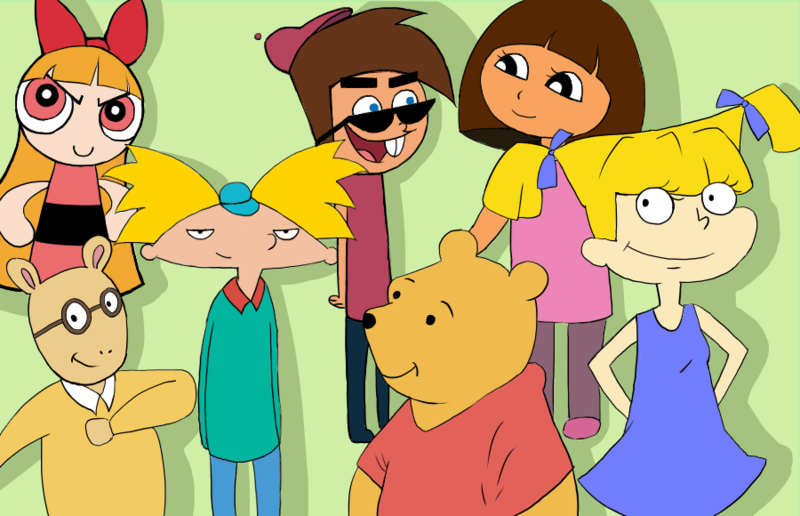 Arnold ends up finding his parents! After a long time of Helga pining for him, Arnold finally gets the message and finds love with Helga. They have a beautiful family together, including a son who, instead of having the head of a football, has the head of a soccer ball. That’s a wrap! It’s definitely possible that in alternate universes, our favorite television childhood companions lead different lives. However, the Clog’s version of these lives is probably what our best pals are doing now.